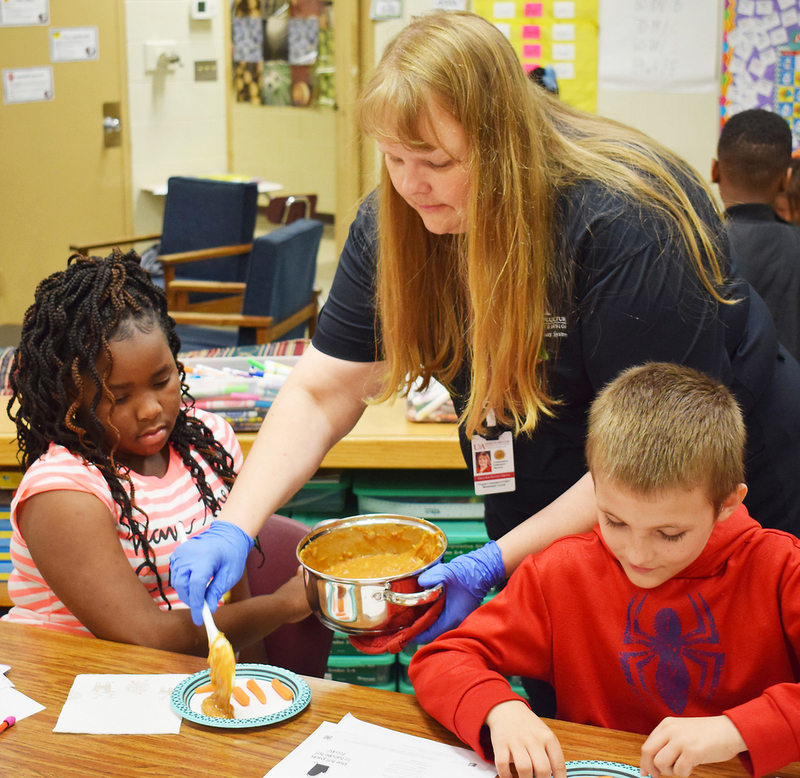 Saundra Harms distributes Ole’ Frijole’s Dip to the third-graders in Courtney Flood’s classroom during their May 9 “Kids in the Kitchen” lesson at Blytheville Elementary School. Harms, nutrition educator with the University of Arkansas Cooperative Extension Service’s Division of Agriculture, just completed her third year at BES teaching students about healthy eating habits. Blytheville School District teachers and administrators are partnering with the University of Arkansas Cooperative Extension Service’s Division of Agriculture for its “Kids in the Kitchen” program, an effort that teaches students about nutrition, specifically healthy eating habits. Targeting third-graders, the partnership is a way to help students and their parents develop healthy eating habits while at the same time fighting childhood obesity. Harms, who works out of the Cooperative Extension Service’s Mississippi County office, has been at Blytheville Elementary School for three years. According to the Dietary Guidelines for Americans 2015-2020, vegetable consumption, as an average among all Americans, is below recommendations. Specifically, she stated, it is lowest among boys ages 9-13 years old and girls 14-18 years old. During the ‘Kids in the Kitchen’ lessons Harms touches on a wide range of areas that all happen to come together in a fun lesson. “As examples, we learn about germs and bacteria when we talk about the importance of handwashing before preparing food or eating,” Harms said. “In one lesson the students learn that vegetables are all parts of plants - roots, stems, leaves, seeds, fruits and flowers. They are frequently surprised to learn they are eating the flower part of a plant when they eat broccoli. In another lesson, we learn how to properly use dry measuring cups. I have bins of rice the students use to practice filling a measuring cup and then leveling it off. Harms also tries to incorporate a physical activity into each lesson. She brought out that many students do not engage in the recommended minimum of at least 60 minutes of physical activity per day at home. “Research has indicated a positive link between yoga practice and youth outcomes,” said Harms. “Yoga can help youth improve their physical fitness, manage stress and improve academic performance. Harms and Courtney Flood’s third-graders spent part of an afternoon May 11 learning how to make “Ole’ Frijole’s Dip”, consisting of low-fat refried beans, taco sauce and cheese. In each of the recipes Harms brings with her the ingredients in a plastic container instead of opening cans or bags. Other recipes she has tried with her students include raw vegetables with yogurt dip, Farmers’ Market Salsa, wheat combo snack mix and trail mix.